My memory of the place has faded a bit since the showing. (...Mainly because I was simply swooning over the hardwood and original trim.) But I'm musing that this place might be the one to try out the Closet Office. 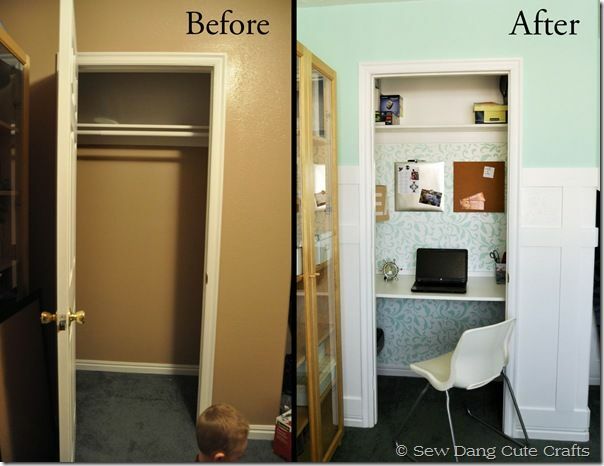 The bedroom closet seems ideal since it lacks a door and has a great window overlooking the backyard. Who would want to cover up that window with messy bundles of clothes?! Also, the bedroom isn't huge. It's lacking in floor space and it might be a wise idea to shove a desk into the closet to make more room for my bed, dressers, and a chair. 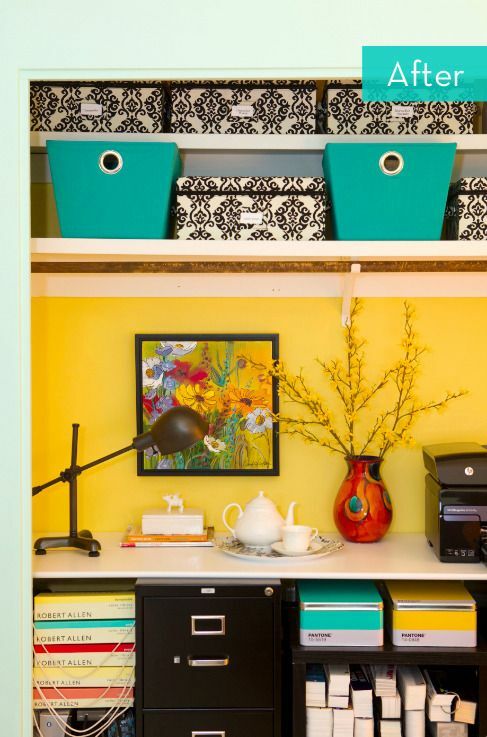 In this sunny yellow bedroom, the Closet Office is dressed up with sheer curtains and cheery yellow accessories. I love all the color coordination, but I don't think I could stick to just one color. Oh. My. Word. I've been in love with the wallpaper used in the back of this Closet Office since I first laid eyes upon it during my internship at Do It Yourself and Storage magazines a couple summers ago. It'd be fun to diy-recreate this desk by buying file cabinets from Goodwill, spray painting them, and putting painted board across the top. The float shelves are great, too, to hold all the pretties in this workspace! If I recall correctly, my bedroom closet just might have built in shelves like this. Such shelves would be ideal for books storage since I won't have a lot of space for a big bookcase. 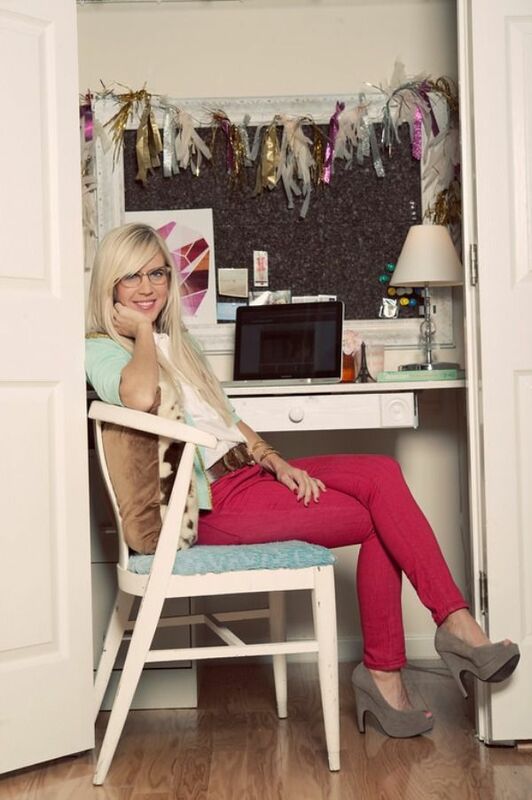 If you can look past the fabulous, lovely lady... you'll be able to admire her just-as-fabulous Closet Office. I'm really digging that bulletin board in the over-sized, ornate frame painted white. 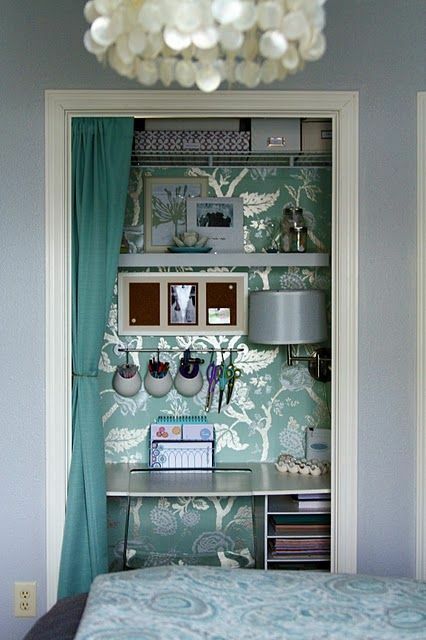 And now the teasing is turning to torture with all these prettily wallpapered closets. I love the metallic sheen of silver that's happening in this space. The hanging storage is fantastic for utensils, too. While I would love having time zone clocks in my cubicle at work, I have no use for this at home. (I'd feel pretty dang fancy though, huh?) I really like the baskets overhead in this one. So simple and cute. Ohh, the colors! They get me every time. Try as I might to stick to a color scheme or tone it down a bit, I just can't commit. Vibrant color combinations like this make me so happy. And the little teapot set is precious. 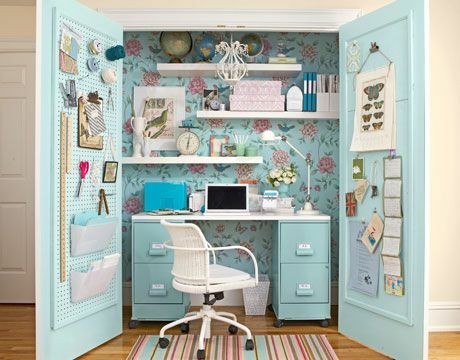 I love the subtle, eclectic mix going on in this Closet Office. The painted bamboo-style chair, the modern sheen of that metallic waste can, the sleek and crisp white, the pops of pale blue. Pretty, pretty. Ahhh, yes. 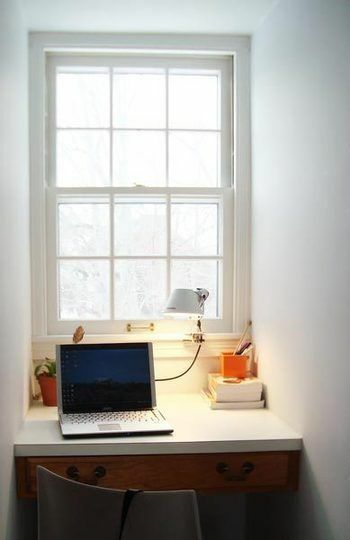 This is kinda how the window would be in my closet... but the closet is bigger than this little nook. 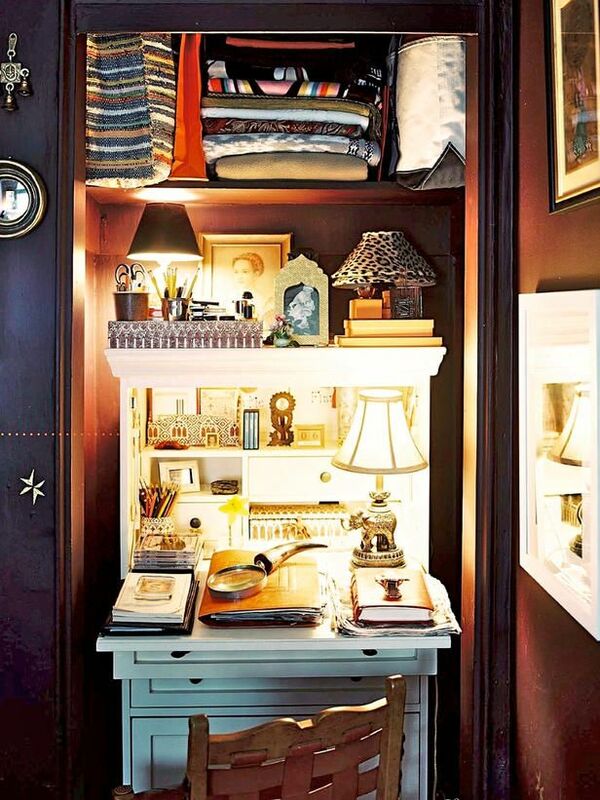 In this Closet Office, less is definitely more. But sometimes (often in my case) more is definitely more. Okay, so this might be too over the top since there's no space to plop down a laptop, open up a notebook, and still have room for a big mug of tea. But it's charming!